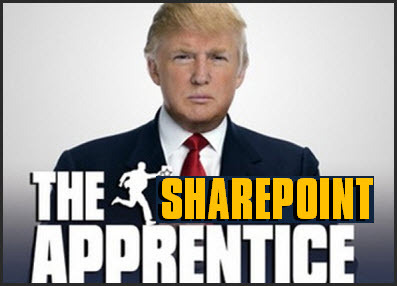 At our Jhb monthly SharePoint user groups in July, we will be combining SharePoint Business Workshops (SBW) and Information Worker (IW), to bring you The SharePoint Apprentice. We have gathered 5 Executive PA’s to help us define the problem statement of how to manage board / exco packs using SharePoint. They will be our judges. Michael O’Donovan from Microsoft will be Donald Trump. We will be dividing the entire audience into equal groups and assigning a Project Manager in each one. The rules will be read to everyone and the groups will have an hour to come up with a solution. The Project Managers will present their solutions to the judges who will decide who wins. “Donald” will fire the rest. There are prizes to be won and great fun to be had. Don’t miss it. Save the date : 10 July from 4pm, Microsoft’s offices in Bryanston. Register on IW or SBW above to be notified when registration opens. Next Insert Link Not Working in SharePoint 2010?